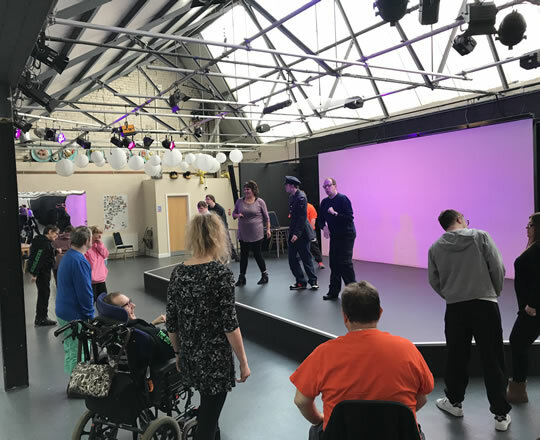 The Big Soup Theatre Group Ltd is a friendly, people centred day service providing real choice and independent thinking by offering a range activities in a choice of state of the art facilities. Based Luton Street in Keighley, we have our own theatre school, kitchen and bistro facilities, hair salon, a white (sensory) room and a film and audio suite. When a person first joins the Big Soup we will establish routines to help our group members better understand and feel comfortable with the structure of their day. People with autism can thrive in situations where they know and can predict 'what happens next'. We will devise individual pictorial timetables, using symbols and words to enhance the feeling of being in control and self-confidence. Within our creative and supportive settings we encourage independence, communication and positive life skills.